The topics covered by PAT training in Dundee include the classification of appliances, the principles of electricity and electrical danger. Also covered are the legal requirements relating to PAT testing, the IEE Code of Practice, methods for the accurate recording of results and learning how to use a PAT tester. Included in the course material is a handbook of PAT testing, course notes and PAT reference cards. Morning tea or coffee and a buffet lunch are provided to all attendees. Regulations insist that anyone involved in or who wants to carry out PAT testing, must be competent to do so. This course, with its certification, is designed to demonstrate that participants are suitably trained and competent to carry out the task. The course gives candidates the opportunity to enjoy supervised, first class instruction in both the practical and technical aspects of PAT testing. Those successfully completing the course are awarded a Certificate of Competence. The course includes a 20 question on-book testing exam, but candidates will be monitored throughout the day to ensure they fully understand the material. Dundee PAT training lasts one day and takes place between 9am and 4pm. Best Western, Queen’s Hotel Dundee, 160 Nethergate, Dundee, Angus, DD1 4DU, Scotland. The course is suitable for both individuals wanting to test appliances for themselves or companies wanting to test their appliances in-house. After completion, those wanting to take electrical training will have the opportunity to sign up for other relevant courses. Previous electrical experience is not a requirement of this course. Anyone participating in the course is recommended to bring along a copy of the IEE Code of Practice for reference during the day. No other material is required. 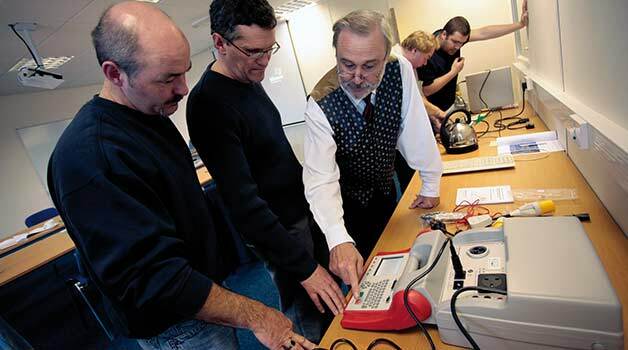 PAT training is invaluable for anyone involved in PAT testing. The course is ideal for those currently working with PAT or who intend doing so in the future. It is valuable to individuals who wish to carry out their own PAT testing, as it will save on the expense of having to hire others.